Why was the geography of the northwest corner critical to the success of Connecticut’s iron industry? Why did Connecticut’s iron industry fail? What might have happened to the development of the northwest corner of Connecticut had the men that owned the iron furnaces decided to become steel producers? How did the geographical location of Connecticut’s iron industry affect the development of transportation routes into and out of the state? 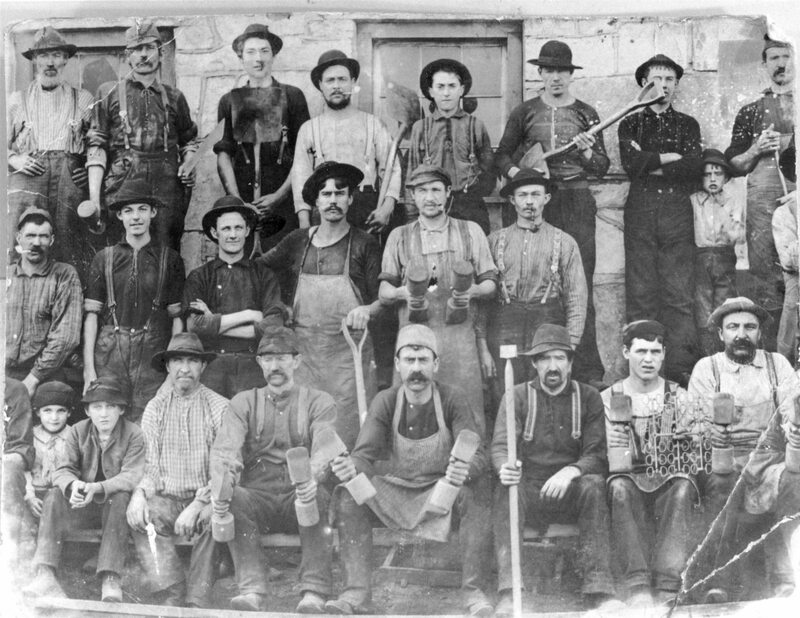 Men working as molders in Sharon Valley – Sharon Historical Society. Note the unusual variety of tools used for the compacting of special sand for casting the iron. Note: the children are not just visiting they are part of the work force. 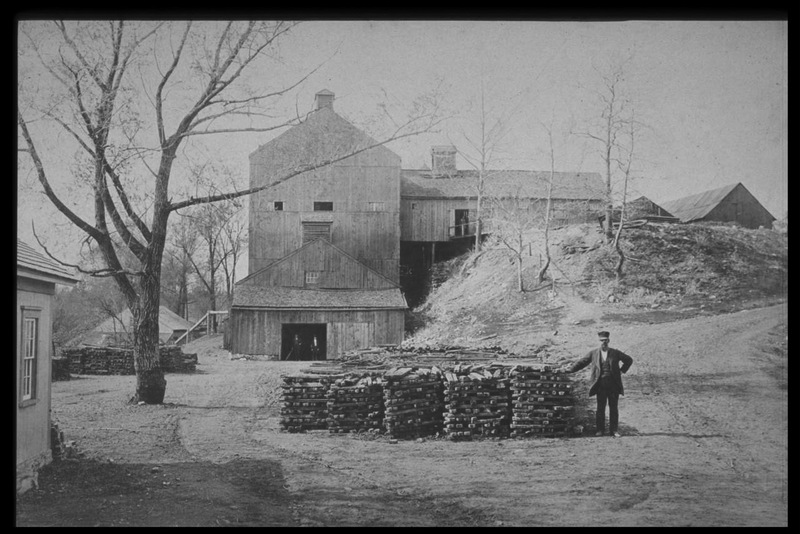 The Sharon Valley Iron Company furnace in 1875 – Salisbury Association. Note the stacks of pig iron in the foreground and beyond the tree to the left. To the upper right stand the charcoal sheds. At the same level is the elongated casting shed running into the main building to the top of the thirty-four foot high blast furnace. Above the unseen furnace is the top house extending sixty-eight feet above ground. To the far left is the blast house with an overshot waterwheel powering pumping tubs through the visible pipe to the top house to heat the blast. The casting shed, center front, contains the sand beds where the white-hot iron formed into pigs and cooled. 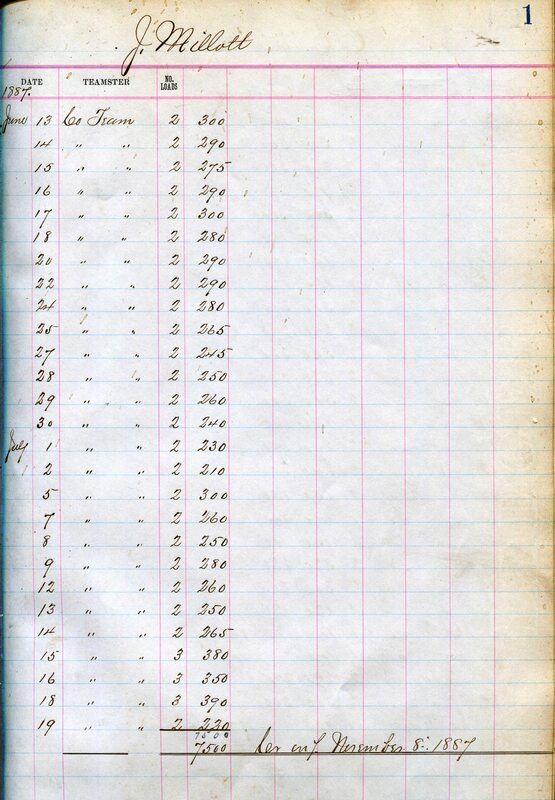 Account Book, Coal, Sharon Valley Iron Co., 1887-1892 – Sharon Historical Society. Using the above primary and secondary source materials, the book, Echoes of Iron in Connecticut’s Northwest Corner, and accompanying video, “Visions of Iron,” students will plot out the geographical locations of materials critical to the success of Connecticut’s iron industry: rivers, forests for the production of charcoal, lime deposits, and iron ore deposits. Once the data has been plotted, students will develop hypotheses as to why the iron industry failed, and what actions could have been taken to foster its long-term success. Using these arguments, students will determine how the character of the northwest corner may have been changed as a result. Plan a mock town meeting on one of the following topics: the possibility of building more iron furnaces across the region; the conversion of cold blast furnaces to hot blast furnaces; bringing major railroad lines closer to the furnace locations; etc. Using online resources develop an interactive map. Watch “Visions of Iron: The Story of the Salisbury Iron District” (DVD), available through the Sharon Historical Society online store. Historian Ed Kirby weaves the narrative thread through this complex story of iron making in the Salisbury Iron District, a geographic area that includes Connecticut, Massachusetts, and New York states. Read the book Echoes of Iron in Connecticut’s Northwest Corner by Ed Kirby, available through the Sharon Historical Society online store. The perfect companion to “Visions of Iron,” Echoes of Iron is the first book to examine the complex history and economics of iron in the northwest corner of Connecticut and the surrounding areas of New York and Massachusetts. ConnecticutHistory.org: Salisbury Iron Forged Early Industry by Ed Kirby.